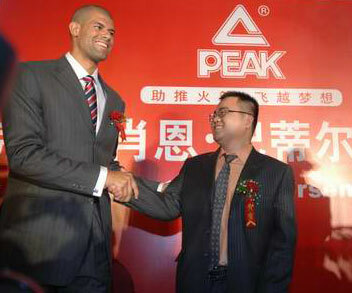 Shane Battier, Yao Ming's teammate with the NBA Houston Rockets, has arrived in Beijing to sign a contract with top Chinese sportswear company PEAK. From now on Battier will be the official spokesperson for the Fujian-based Chinese brand and wear its sneakers in every NBA game. Shane Battier is the 3rd NBA star, after Damon Jones and Shaquille O'Neal, to be signed by a Chinese sportswear company, with the former 2 having been signed by Li Ning. According to the Chinese website tom.com, PEAK, which signed a 2-year US $4 million sponsorship with the Houston Rockets in February of this year, considered other NBA stars like Dirk Nowitzki, Andrew Bogut, Tony Parker and Vasillis Spanoulis, before finally deciding to sign up Battier. Shane Battier, who starred in the recent Basketball World Championships for the Dream Team Seven, was traded to the Houston Rockets from the Memphis Grizzlies this summer in exchange for Stromile Swift and the draft rights to Rudy Gay. He's regarded as the Rockets' most important sign-up for the new season. PEAK has sponsored the top domestic basketball league powerhouse Bayi since 1992.